What a beautiful sight, as 15 ladies filled the museum courtyard with their easels, brushes and palettes in the recent Plein-Air workshop by Devere Burt on September 4th & 5th. 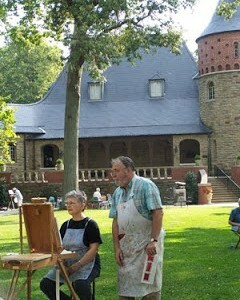 Devere is a professional artist and instructor from Cincinnatti, Ohio. The 2-day workshop was geared towards artists whom wished to enhance their techniques and create a unique composed painting. In conjunction with the “Plein Air Workshop”, the Audubon Museum and Ohio Valley Art League will be hosting an exhibit during our “2010 Audubon Celebration” called the”Views of Audubon”. All area artists are invited to participate in this event from September 2009 through May 30, 2010. Artists are asked to use the Audubon Park landscape and wildlife as the theme for artworks created with the following media: oil, watercolor pastel, ink, acrylic or colored pencil. Artists will have the opportunity to walk where Audubon himself walked and may choose the seasons of fall, winter, or spring for inspiration. Select artwork from the paint out will be featured in the “2010 Audubon celebration” at the Audubon Museum, entitled “Views of Audubon.” Participating artists must sign in at the Audubon Museum desk to be eligible to enter artworks in the exhibit. The exhibit will open at the Audubon Museum August 4, 2010 and continue through September 30, 2010. For further information please contact Kim McGrew at the Audubon museum or Jule McClellan from Oval.